The International Monetary Fund has reduced its world growth forecast to 3.5 percent this year, from 3.8 percent. Sluggish growth from China, Russia, the EU, and Japan won’t offset the benefits of cheaper oil. The outlook for 2016 was also cut to 3.7 percent from four percent. Here is the January 2015 report released on January 19. The downward revisions were influenced by the worsening prospects in China, Russia, the EU, and Japan, with the last two posing the biggest threat to growth. The most severe cut was to Russia, whose economy will contract by three percent, according to the IMF, a huge departure from its previous 0.4 percent growth estimate. This economic uncertainty will spillover into CIS countries, which are closely tied to the Russian economy. One of the major disappointments of 2014 was the low growth in Japan, the report said. “The most obvious downside risks involve stagnation in the euro area and in Japan,” IMF Chief Economist Oliver Blanchard said. The eurozone’s three largest economies, Germany, France, and Italy, all had their growth revised, but Spain got upgraded. The theme of the paper is “cross currents”, which the IMF identifies as“strong and complex.”In short, what is good news for one economy is usually bad news for another. While many economies are emerging from recession and economic crisis, others are sinking, a strong dollar and weak euro saves some and stings others, dipping oil benefits importers but not exporters. Since September, global oil prices have tanked 55 percent. Lower oil prices, which were expected to give a 0.3-0.7 boost to global GDP, will not offset the greater threats the slowing down of big advanced and developing economies, since investment takes a hit. "The boost from lower oil prices is expected to be more than offset by an adjustment to lower medium-term growth in most major economies other than the United States,” the report says. Volatile currencies will continue their swings, again tilting the scales in favor of some, and not others. Countries tied to specific currency-denominated debt are either getting a major discount or added burden, depending on where their money is. Since August, the US dollar has increased seven percent in real terms, while the euro has lost three percent, and the Yen 10 percent. 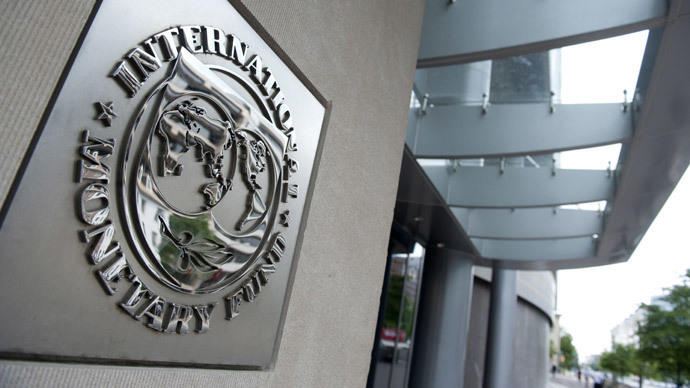 The IMF prognosis echoes Monday’s deflated forecast from the European Bank of Reconstruction and Development (EBRD). The IMF predicts the average oil price in 2015 will be $56.7 a barrel, a slight relief from today’s prices hovering near $50 a barrel.